The sternum and sternoclavicular joints are difficult to evaluate with plain radiographs. The value of CT in assessing lesions of the sternum and sternoclavicular joints has been well documented, but the potential role of MRI has not been emphasized. We present the MRI techniques, normal appearances and a spectrum of abnormalities, and emphasize the role of MRI as a useful radiological investigation for the sternum and sternoclavicular joints. Breath-hold images were obtained in threeorthogonal planes, coronal, sagittal and axial,using a general purpose body array coil on a1.5 T Siemens Vision scanner (Siemens, Erlangen,Germany). Coronal images were obtained in two oblique planes, one parallel to the manubrium and the other parallel to the body of the sternum. The sternum is optimally demonstrated in the sagittal plane with clear delineation of the manubrium, the body of the sternum and the xiphoid process. The outer cortex and central marrow are well seen (Figure 1 ). Coronal images are obtained in two planes for clear views of the manubrium and body of the sternum as they are angulated at the manubriosternal junction. The axial images provide additional information, particularly in the evaluation of congenital chest wall deformities. Coronal reformatted image from chest CT shows the three parts of the sternum—the manubrium (M), sternal body (B), and xiphoid process (X)—as well as the clavicles (C), internal mammary arteries (arrowheads), and anterior (red) and posterior (blue) muscular insertions, including the origins of the sternocleidomastoideus (1), subclavius (2), and pectoralis major (3); attachments of the sternohyoideus (4) and sternothyroideus (5); origin of the transversus thoracis (6); and attachments of the small part of the rectus abdominis (7) and fibers of the diaphragm and transversus thoracis (8). The manubrium is the broadest portion of the sternum, and the farthest cephalad. It has a superior central notch (suprasternal or jugular notch) and two lateral fossae (clavicular notches) that articulate with the clavicles. The manubrium also articulates with the first and second ribs and the body of the sternum. Several muscles (eg, sternocleidomastoideus, sternohyoideus, and sternothyroideus) are attached to its anterior surface . The body of the sternum is flat, with an irregular anterior surface. Superiorly, it articulates with the manubrium at the manubriosternal joint (also called the sternal angle or symphysis). Inferiorly, it articulates with the xiphoid process. The lateral borders of the sternum articulate with the second through seventh ribs. The pectoralis major muscles insert on its anterior surface. The angle between the body and the manubrium (sternal angle) is an important clinical landmark because it demonstrates the site of articulation with the second rib . The xiphoid process (from the Greek word xiphos, meaning “straight sword”) is a thin and elongated bone that is subject to many variations. It is cartilaginous early in life and may become completely ossified and fused to the sternal body in old age . 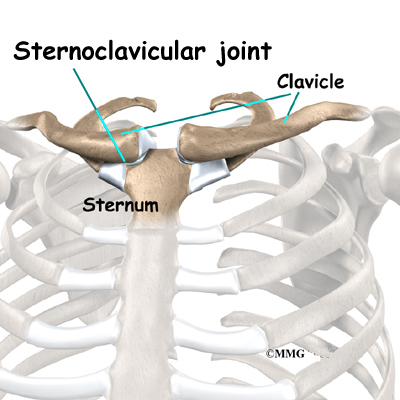 The sternoclavicular joint is a synovial joint that connects the axial skeleton and the upper extremity and is involved in the movement of the upper extremities The major components of the sternoclavicular joint include the anterior sternoclavicular ligament, interclavicular ligament, costoclavicular ligament, articular disk, and articular cavities . Computed tomography (CT) is the modality of choice to evaluate anatomic detail as well as pathologic conditions of the sternum, sternoclavicular joints, and adjacent soft tissues . Axial Plane: Center on Sternum on coronal scout and prescribe plane perpendicular to line through sternum. Scan through SC joint. Sagittal Plane: Prescribe plane with line that touches the anterior cortex of the sternum and clavicle heads. Scan through both SC joints. The Anterior Sternoclavicular Ligament (ligamentum sternoclaviculare anterior).—The anterior sternoclavicular ligament is a broad band of fibers, covering the anterior surface of the articulation; it is attached above to the upper and front part of the sternal end of the clavicle, and, passing obliquely downward and medialward, is attached below to the front of the upper part of the manubrium sterni. This ligament is covered by the sternal portion of the Sternocleidomastoideus and the integument; behind, it is in relation with the capsule, the articular disk, and the two synovial membranes. The Posterior Sternoclavicular Ligament (ligamentum sternoclaviculare posterius).—The posterior sternoclavicular ligament is a similar band of fibers, covering the posterior surface of the articulation; it is attached above to the upper and backpart of the sternal end of the clavicle, and, passing obliquely downward and medialward, is fixed below to the back of the upper part of the manubrium sterni. It is in relation, in front, with the articular disk and synovial membranes; behind, with the Sternohyoideus and Sternothyreoideus. 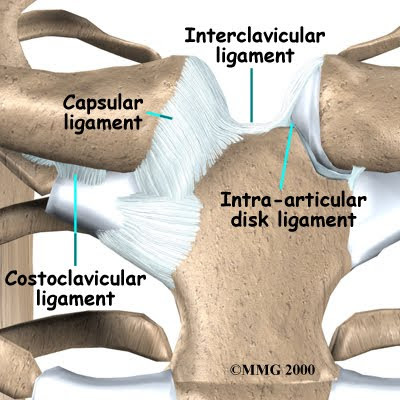 The Interclavicular Ligament (ligamentum interclaviculare).—This ligament is a flattened band, which varies considerably in form and size in different individuals, it passes in a curved direction from the upper part of the sternal end of one clavicle to that of the other, and is also attached to the upper margin of the sternum. It is in relation, in front, with the integument and Sternocleidomastoidei; behind, with the Sternothyreoidei. The Costoclavicular Ligament (ligamentum costoclaviculare; rhomboid ligament).—This ligament is short, flat, strong, and rhomboid in form. Attached below to the upper and medial part of the cartilage of the first rib, it ascends obliquely backward and lateralward, and is fixed above to the costal tuberosity on the under surface of the clavicle. It is in relation, in front, with the tendon of origin of the Subclavius; behind, with the subclavian vein. The Articular Disk (discus articularis).—The articular disk is flat and nearly circular, interposed between the articulating surfaces of the sternum and clavicle. It is attached, above, to the upper and posterior border of the articular surface of the clavicle;below, to the cartilage of the first rib, near its junction with the sternum; and by its circumference to the interclavicular and anterior and posterior sternoclavicular ligaments. It is thicker at the circumference, especially its upper and back part, than at its center. It divides the joint into two cavities, each of which is furnished with a synovial membrane.